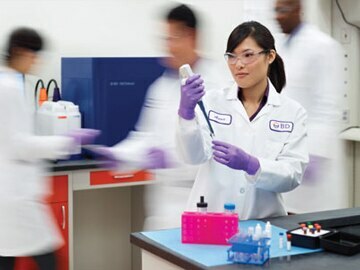 Every BD Biosciences flow cytometer system is backed by a world-class service and support organization with unmatched flow cytometry experience. Since commercializing the first cell sorter in 1973, BD has delivered flow cytometry systems that are ever more powerful, dependable, and easy to use. This expertise is made available to BD Biosciences customers through comprehensive training, application and technical support, and expert field service. Hands-on training is included with each BD flow cytometer. In addition, training courses are held at BD training centers worldwide. BD flow cytometry training courses combine theory and practice to provide participants with the skills and experience they need to take full advantage of the capabilities of their BD Biosciences system. BD Biosciences technical application support specialists are available to provide field- or phone-based assistance and advice. Expert in a diverse array of topics, BD technical application specialists are well equipped to address customer needs in both instrument and application support. When instrument installation or service is required, a BD Biosciences Technical Field Service Engineer can be dispatched to the customer site. BD Biosciences field service engineers are located across the world. On-site service and maintenance agreements are available to provide long-term support for any BD Biosciences system. Instruments can be customized to meet customer requirements via the Special Order Research Products program. Mobilizing technology for research applications requires close collaboration. The Custom Technology Team (CTT) at BD Biosciences works with customers to provide solutions through custom reagents, panels, and assay protocols. Staffed by leading scientists with breadth and depth of technical expertise in cytometry, the CTT will coordinate with researchers to study the problem at hand, make recommendations, and help implement the solutions. In this way, BD Biosciences technical know-how is translated into practical solutions that allow customers to focus on research.